Welcome to day 2 of Ice Cream Week 2014! This year the event is hosted by Kim of Cravings of a Lunatic and Susan of The Girl in the Little Red Kitchen. We have teamed up with 25 amazing bloggers to bring you ice cream treats all week long. It's an epic week full of frozen treats, beets [wait, what? beets? ], and a giveaway! Go Jacks! Let's get the new school year off to a great start! Humans crave connection with other humans. Vegetables can forge that connection. This may seem a strange way to start headnotes on a chocolate beet milkshake recipe, but I'll circle around and it will make sense, I promise. This will be especially true if you're a person who eats seasonally from a Community Supported Agriculture (CSA) farm share or one who succumbs to the bright colors of the farmer's market and ends up with way more vegetables than you planned. A couple of weeks ago I took my son to sled hockey camp. We were fortunate that several Big Names in the sport were in attendance. My son held gold medals from Sochi 2014 and Vancouver 2010 and skated alongside the gracious athletes who earned them. The last morning of camp I met the guest coach. Conversation quickly turned to food, as it always does around me, and he shared memories of the meals he'd eaten while in Sochi and in other international travels. Then I mentioned something about our farm share, and this man said "I'm looking forward to fresh corn". BOOM! All of a sudden this guy went from, in my eyes, an internationally famous coach (with whom I had little in common) to a fellow seasonal eater. I, too, know the feeling of anticipating the vegetables of the upcoming season. In late winter I crave the fresh greens of Spring, in Summer I crave tomatoes, and in Fall I'm crave sweet potatoes and winter squash [winter is the time of the Strategic Winter Squash Reserve, my freezer, and my pantry]. Local, seasonal vegetables forged a connection. Beets, however, are one of those vegetables that I never crave. I eat them because they come in the farm share box and it's important to eat a variety of foods, but I never crave them [I do crave beet greens]. I just try to have interesting ways to get them out of the crisper and into our bellies. My kids are game to eat, and help prepare, most of the concoctions I come up with. Since today is their first day of school I thought I'd share an unusual way to drink those farm share beets--in a chocolate beet milkshake. Would I suggest you run out and buy beets for this? Heck no! If you're running out to buy something, pick up the 4 ingredients needed for making an ice cream pie at home instead. But if you have beets and are looking for ways to use them, this goes down pretty well. I got the idea to make this by reading that warm water (water??) is used to melt the cocoa powder for milkshakes. Water? In a milkshake? How 'bout warm roasted beets instead of water? Me: "How else would you like to consume beets?" My girl: "Through the soil as compost for peach trees." Ah, well. Can't win 'em all. I'd drink one again. Maybe a double chocolate one. Preheat the oven to 400 degrees Fahrenheit. Place the beet (washed, but not peeled) in the center of a sheet of aluminum foil, drizzle with a bit of olive oil, seal the foil and bake for an hour until soft. Let the beet cool enough so that you can slip off the skin. 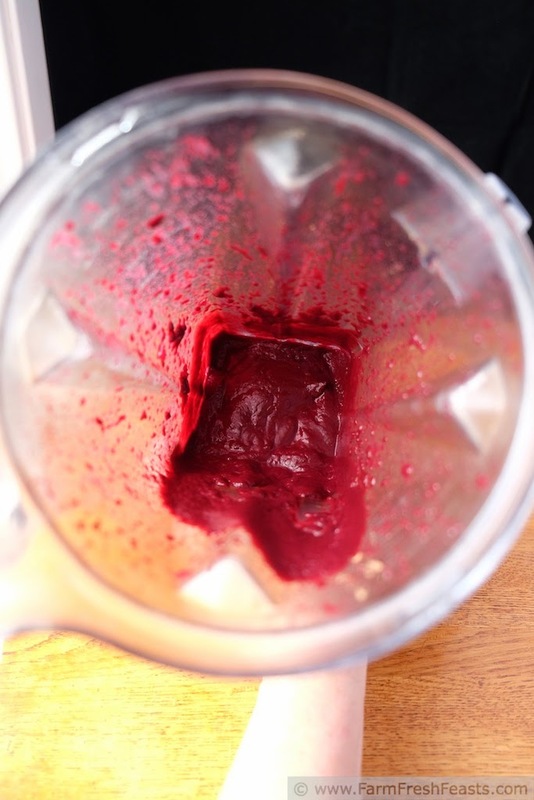 Place the warm beet in a blender (I use my Vitamix--it's a year younger than my daughter!) with cocoa powder, sugar, and 1 Tablespoon milk. Blend until smooth. If you need a bit more liquid, add the ½ cup milk now too. Set aside to cool to room temperature. When you're ready for your milkshake, add 1 pint of vanilla ice cream (and ½ cup milk, if you didn't add it earlier) and blend thoroughly. Serve. Wow, would have never thought of this combo but what a gorgeous color. I would love to try that!! If I can get the kids to drink their beets I consider that a success. The color is amazing! 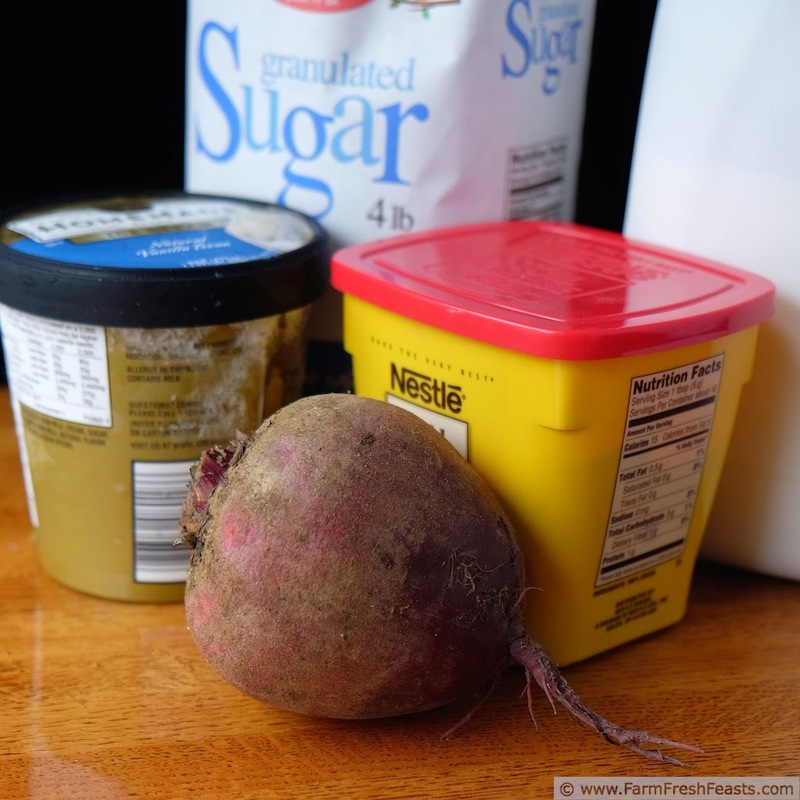 I love beets, but never thought of using them in a dessert! You clearly are not as overwhelmed with beets as I am. 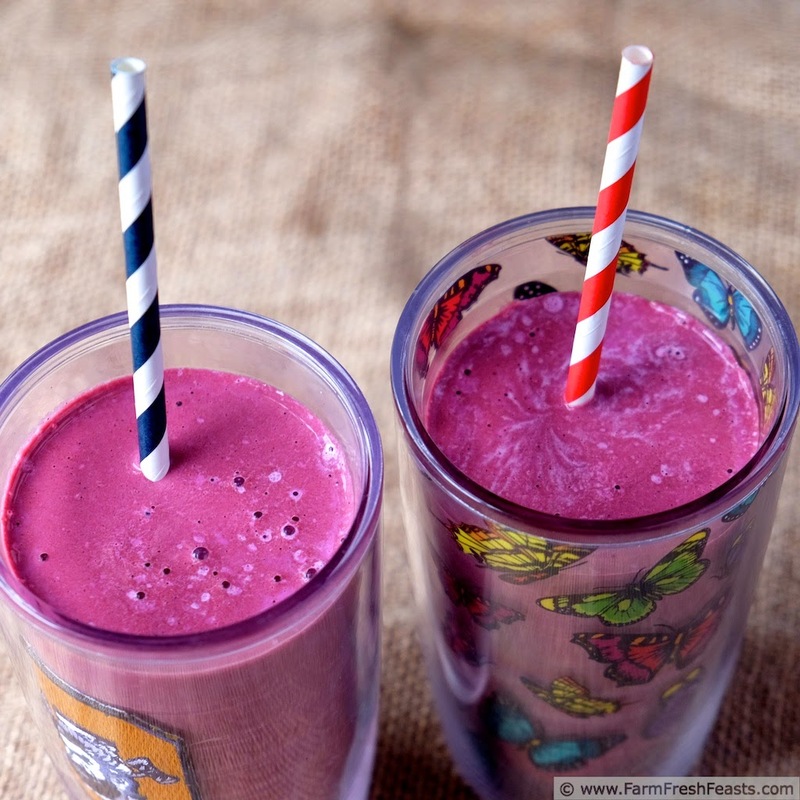 The color of this milkshake is just mesmerizing. I need a pair of shoes in that color. Seriously. I love beets, and pairing it with chocolate and ice cream is just the bees knees. Now I'm wanting beets, chocolate ice cream, and honey. I bet that would be good. I love beets, and they go surprisingly well with chocolate! I'll have to try this. Beets + chocolate, beets + orange. Now I'm thinking about beets + chocolate + orange. I think I'm just all over the place with beets today. 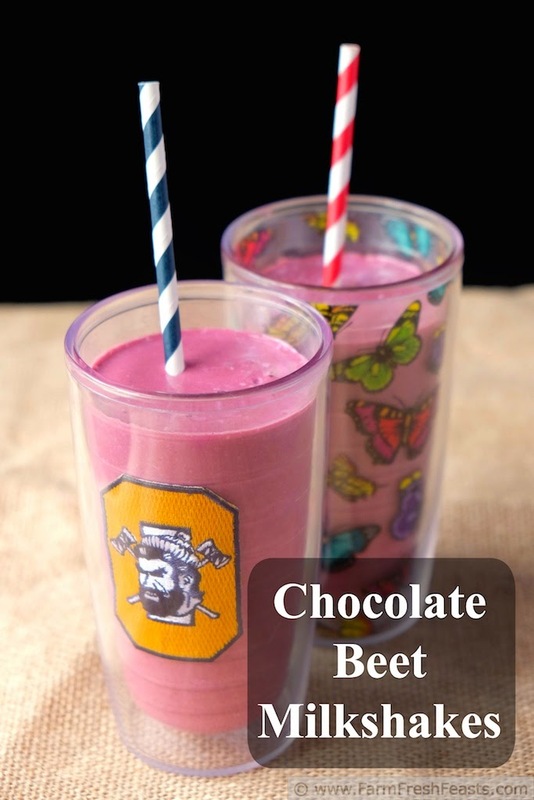 I love the headnotes for this recipe, and I'm intrigued by adding beets to a milkshake. As you know, I pretty much only drink my beets, usually raw, and I've even made beet juice mimosas before, so a milkshake doesn't sound that far fetched to me. The color of this drink is gorgeous by the way. Nicely done Kirsten. Thank you--sometimes the head notes just click, and this was one of those times.